Apply for longer loan tenure: Your EMI depends upon the tenure of the loan. Higher the loan tenure, higher will be your loan amount eligibility. If your loan eligibility for a 10 year loan is Rs 15 lakh, you may evaluate the option of taking 15 year loan to increase your loan amount eligibility. 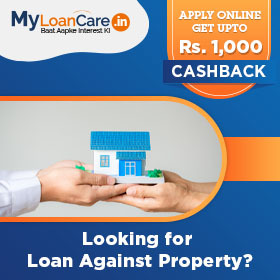 You can also check your loan eligibility with MyLoanCare Property Loan Calculator. Prepay your existing loan completely: If you have an existing loan near to closure, it might help to pay back the loan to increase your monthly savings and enhance your loan eligibility. Add any co-applicant (Spouse or parents): If you include your spouse or parents as loan co- applicant, then your overall loan eligibility will go up as more income is available to support loan repayment. Please ensure that the applicant is earning, has a strong credit track record and can produce credit and income proofs, as required. Add Rental Income: Some banks are also open to consider your rental income as a part of your net income to calculate your loan eligibility. Hence, it is advisable to disclose and report your rental income if you want the highest loan amount. Maintain good credit score: Before applying for loan against property, check out your CIBIL score. Look for errors, if any. Do not apply for a loan with 10 different lenders to get a loan quickly. Pay all your credit card bills and loan EMI on time or you can also do advance payment to improve your CIBIL score and your eligibility for a loan. Choose the property to be mortgaged wisely: Banks view residential property as the safest and hence, offer the highest LTV on such properties. If you have an option, always try to avail a loan against a residential property to get highest loan and lowest interest rate. Commercial property mortgage tend to get you lower loan amount eligibility and higher interest rate, as perceived risk is high. Only a few banks offer loan against industrial property and that too at lower LTV and higher interest rate. Illustration – Mr. A is 30 years old and needs a loan to wants to expand his business. He is willing to mortgage his commercial property with a market value of Rs. 60 lakh. His net income is Rs. 50,000 per month and he has no other fixed obligations. Banks will calculate Mr. A’s loan amount eligibility based on his age, net income and his fixed expenses obligations as a per cent of his net income. Based on his eligibility calculation, various banks can offer different interest rates to Mr. A with different EMIs. He should choose the bank which offers the highest loan amount eligibility with lowest interest rate and lowest EMI. Banks offering highest eligibility of Rs. 40 Lakh are HDFC. EMI amount ranges from Rs. 39,005 to Rs. 0 Cr at different interest rates offered by banks.